New exhibition by artist Teresa Jaynes explores the nature of perception. Now on display at the Library Company of Philadelphia. The Library Company presents a major new exhibition entitled Common Touch: The Art of the Senses in the History of the Blind. 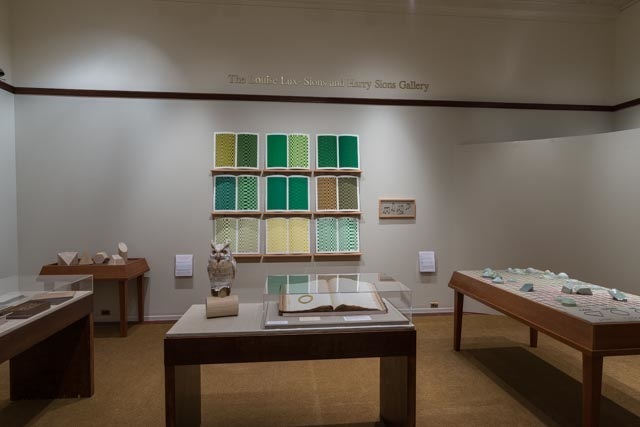 Organized by the library’s Visual Culture Program (VCP at LCP)and curated by artist-in-residence Teresa Jaynes, the exhibition is inspired by the Library Company’s Michael Zinman Collection of Printing for the Blind. By juxtaposing her multisensory artwork with historical materials documenting the education of the visually impaired in the 19th century, Jaynes explores the nature, foundations, and limits of perception. Common Touch is on view April 4-October 21, 2016, Monday-Friday, 9 am to 4:45 pm, Library Company of Philadelphia, 1314 Locust Street, Philadelphia. Common Touch immerses visitors into a world of discovery in which history intersects with new forms of tactile expression. Complemented by 19th-century personal narratives, raised-print textbooks, and teaching tools of the visually impaired, Jaynes original works will challenge our cultural assumptions about the interrelationship between art, sight, and the history of disability. Common Touch exhibition in the main gallery of the Library Company of Philadelphia. For more information about the exhibition and its accompanying programming, visit commontouch.librarycompany.org. Common Touch has been supported by The Pew Center for Arts & Heritage. For more than 25 years, Teresa Jaynes has created installations and artists’ books based on extensive research in special collections and libraries. She is a recipient of a Pew Fellowship in the Arts, as well as grants from the Independence Foundation, Art Matters, National Endowment for the Arts, and Pennsylvania Council on the Arts. Jaynes received her BFA from the University of Texas at Austin and her MFA from Tyler School of Art, Temple University. She has exhibited her work in New York, Chicago, Minneapolis, and Philadelphia, including the Philadelphia Museum of Art, Institute of Contemporary Art, and The Rosenbach Museum & Library. Call for Participation: The Digitization Cost Calculator’s "Day of Data"
Submit one day of data! Digitization is a costly business — estimating expenses associated with a given digitization project, a fiscal year, or for a grant application, can feel disconnected from the reality of staffing, timelines, and true project costs. In 2014/15 the Digital Library Federation’s Assessment Interest Group developed a beta version of a Digitization Cost Calculator to help with digitization project planning by using contributed data to produce average estimates of costs and time for various aspects of the digitization process. Over the past year we’ve redesigned the calculator’s interface and worked with the digital library community to choose and define processes that should be included in the new and improved calculator (see the processes and definitions document here). But now we need your help! We can’t build the redesigned calculator unless the community contributes more data. We know that data is difficult to collect, so we are asking you to collect a single day of data to contribute to the calculator, in the month of June. You can choose one or more of the fields for which the calculator needs data. Please help us bring the new and improved calculator to life bysigning up for the Day of Data and contributing data from your institution during the month of June. Sign up to collect and contribute data for just one day in June! What is Day of Data? Day of data is a low barrier, low time commitment way to contribute the critical pieces of missing data needed to move this important project forward. Because contributors are only asked to commit to tracking and submitting digitization data for one day in the month of June, a greater number of institutions are able to add their data to the creation of this community-driven tool. What will I need to do? You will commit to timing yourself, staff, or student as you/they perform digitization processes during a single day. The areas in which you can contribute time data include image capture, descriptive metadata creation, quality control, various preparation processes such as condition review, rebinding, formatting, and various post-processing processes such as alignment/rotation, image cropping, and stitching. When will I need to do it? Pick any day or time during the month of June that works for you! Will the information I contribute be associated with my institution? Sort of. The data you submit will be aggregated by the calculator with all other data submissions and displayed as part of an average on the results screen when people use the calculator: No individual institution’s information will be discernible in the calculator. However, individual institutional data will be shown on the Notes About Data webpage, another part of the Digitization Cost Calculator website. This allows calculator users to get a feel for the wide variation in time and in practice from institution to institution and project to project. Seeing the data apart from the aggregate average can also be helpful if a user feels their institution is more similar to one or more other institutions in the list, and allows them to calculate custom time estimates. The time period over which the data contribution was collected will also be displayed on the Notes About Data page. What if I have some historical digitization data to contribute now? Great, we’d love to have your historical data! Contributions are accepted on an ongoing basis, but please try to contribute whatever you can by the end of June 2016 so we can get the new calculator up and running! How do I contribute historical data now? Send an email tojoyce.chapman@duke.edu, subject line Cost Calculator. Something new is coming to MARAC in Newark – the MARAC Business Archives Forum! In conjunction with our Spring 2017 conference we’re arranging a daylong event focused on business archives. All MARAC members are welcome, though the focus of the day will be business archives. The day will include presentations related to the conference theme of Adaptable Archives: Redefine, Repurpose, and Renew, as well as ample time for informal networking among attendees. The day is going to be built around whatever creative types of proposals are received, so sky’s the limit! Proposals will be selected based on their relevance to business archivists specifically, alignments with the theme, and uniqueness of topics. The deadline for proposals is Friday, June 3, 2016. Questions? Contact Emily Cottle, emilyrcottle@gmail.com. What: A daylong gathering of business archivists from the MARAC region to discuss and share information aligned with the conference theme of Adaptable Archives: Redefine, Repurpose, and Renew.